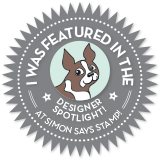 This weeks Simon Says Stamp Challenge: Based On A Book. I was very excited about this challenge and immediately wanted to do Dante's Inferno. I went to our "local" half price books for a cheap copy of the book to use as part of my layout. This may be my favorite art journal page yet!!! Hope you all enjoy. Way Cool!!! Oh, that medium you used for the bricks... wow!!! So did you end up adding color to the bricks or is that how they dried? Turned out awesome!